The Congress of the Confederate States was the legislative body of the Confederate States of America. It existed during the American Civil War from 1861 to 1865. Like the United States Congress, the Confederate Congress consisted of two parts. The upper house was the Senate. It was made up of two senators from each state who were chosen by their state legislatures. The lower house was called the House of Representatives. Its members were elected by the citizens of the individual states. On February 4, 1861, the Provisional Congress met at Montgomery, Alabama. Representatives of each state were appointed by their state secession conventions. The session ended on February 17, 1862 which also ended the Provisional Congress. On February 18, 1862 the first congress held its first session. After four sessions, the congress adjourned sine die (without setting a day for another meeting) exactly two years later. The Second Congress met for two sessions before the end of the war. Its last session ended on March 18, 1865. 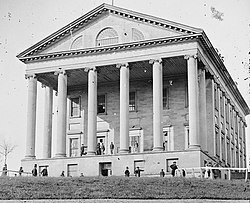 The first act of the Confederate Congress was to keep in force all laws of the United States which did not conflict with the Confederate States Constitution. The Confederate States Constitution, however, was not adopted until March 11, 1861. It was almost the same as the United States Constitution but with a few changes. These included the President of the Confederate States of America, Jefferson Davis, having a line-item veto. The president served only one six-year term and could not be voted president again. Members of the president's cabinet also served as non-voting members of Congress. The central government of the Confederacy, the president and the Congress, could not make laws that overruled those of the individual Confederate states. The Confederacy did not have a Supreme Court because no agreement was ever reached on how it would work. Because the Confederate government was limited, they could not raise much money. States could and sometimes did refuse to send their militias if they felt they were needed in their own state. Congress was not able to control inflation and as prices went up drastically there were food riots in the South including the Capital city of Richmond, Virginia. While during this time the United States Congress made a great number of changes in U.S. law. At the same time, the Confederate Congress was just trying to keep the Confederacy alive and working. Of the many acts passed was the first military draft passed in 1862. They also approved black men as soldiers in March of 1865. It had been debated for some time as it became apparent the South could lose the war. About this same time, in 1864, the Confederate Congress was in a near-panic. The Army needed more soldiers. Among the resolutions was for members of Congress to join the military and fight. Another resolution was to exempt men over the age of 50 from military service. This included most of the members of Congress. Others wanted to Congress to leave Richmond and find a place of safety. While the Confederate Congress debated, the Union Army was pushing closer and closer to Richmond. At the same time, Sherman's March to the Sea was pushing towards Atlanta, Georgia. ↑ 3.00 3.01 3.02 3.03 3.04 3.05 3.06 3.07 3.08 3.09 3.10 3.11 3.12 "Confederacy". HistoryNET. Retrieved December 7, 2016. This page was last changed on 5 July 2017, at 01:58.